Today’s polish is a shade that I nearly picked up on a whim during my last Shoppers Optimum haul, but I decided against it (since I’d already hit my $200 redemption). Soon after, Lancôme Canada held a 20% off Cyber Monday sale plus GWP which, with a whopping 15% cashback from ebates Canada, became a very nice opportunity for me to pick up some gifts and some goodies for myself. Rouge Midnight (425) is Lancôme’s answer to the “ruby slippers” nail polish. It’s a deeper, neutral red packed with swirly gold shimmer. It’s pretty stunning in person, and in bright light, it definitely gives off a ruby slippers vibe, since the shimmer is less obviously gold once it’s submerged in the red polish. 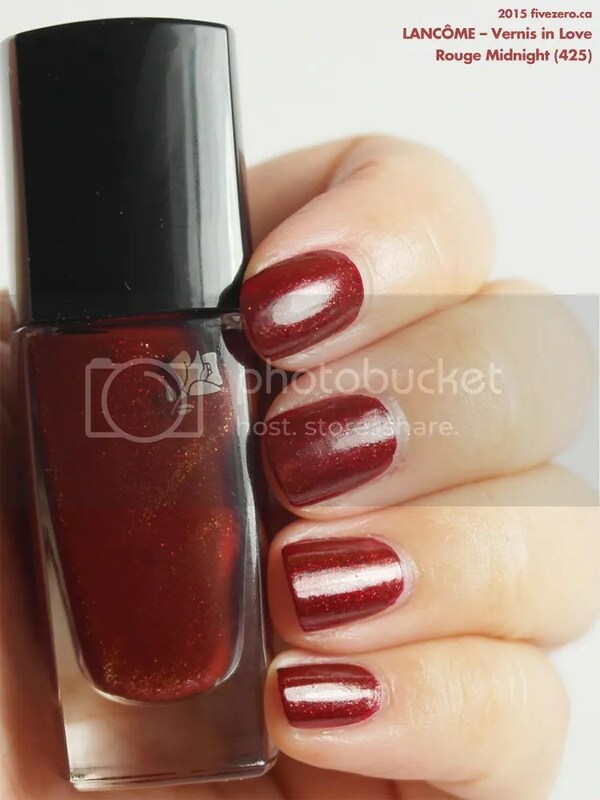 In dim light, it’s a deep red with a touch of shimmer; bright light really brings out the best in this polish. 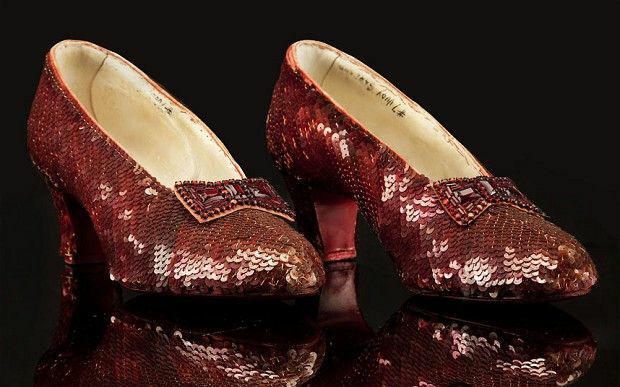 Dorothy’s ruby slippers from The Wizard of Oz (1939). The slippers were silver in the original book by L. Frank Baum, but the filmmakers changed them to red to take advantage of Technicolor. 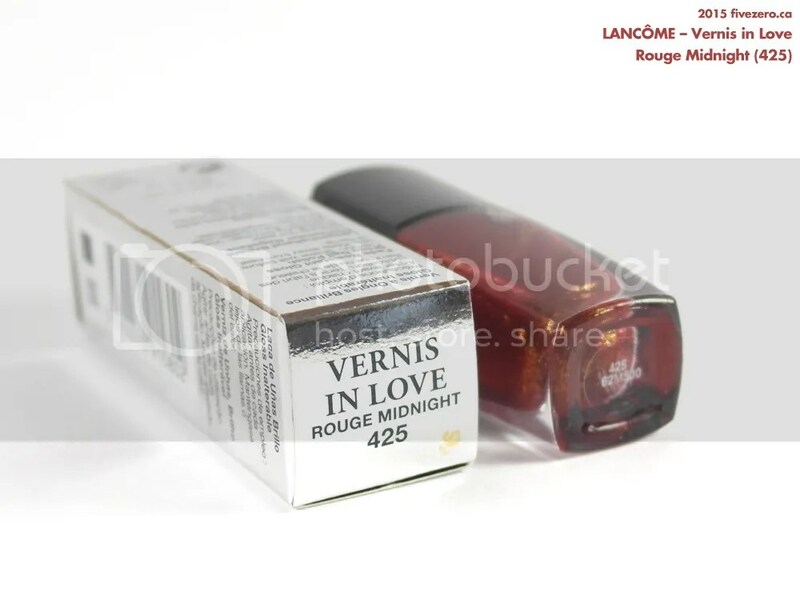 This is my first time trying Vernis in Love, even though the product line has been out for quite a while, now. The last time I tried Lancôme polish, they came in little rectangular GWP bottles and were really not very good. I’m pleased to say that Vernis in Love, at least in this particular shade, is much improved. The brush is very slightly paddle-shaped, and not too wide; it applies the polish well. The pigmentation is also very good, and two coats gives perfect coverage. My only complaint is that the polish could dry to a shinier finish. I would definitely recommend a glossy top coat over Rouge Midnight to bring out its best. Overall, it’s a nice polish, but for the price and size (it’s a mere 6 mL), it’s not a great deal unless you find a color you really love. The packaging is very pretty, though I would prefer if the bottle had the shade name on its label. I’m compelled to keep the polish in its box because of this oversight. 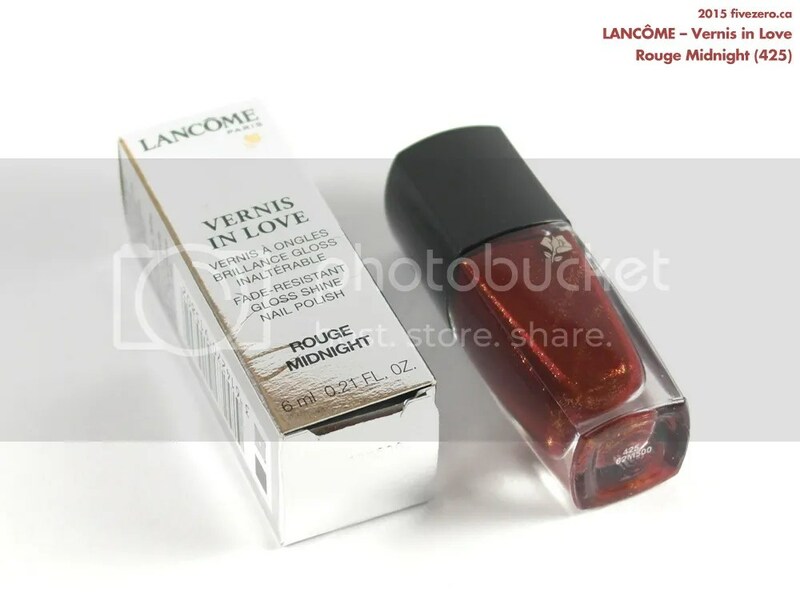 Lancôme Vernis in Love retails for US$15.50 / CA$19 and contains 0.21 US fl oz / 6 mL. It is free of toluene, formaldehyde, camphor, and dibutyl phthalate (DBP), and made in France. Lancôme was founded in 1935 as a fragrance house, and quickly expanded into skincare and cosmetics the year after. Lancôme was acquired by L’Oréal in 1964. I’ve not tried any of Lancome’s polishes – this one is a perfect Christmas festive colour! There’s something about these polish bottles that I don’t like – the narrow base makes it prone to knocking over for a klutz like me. I wish I could have captured a good pic of it in bright sunlight!